I received this fun quilt last weekend. I just had Thursday – Monday to get it done and I was gone both Friday & Monday. Very funny but totally doable knowing it was coming ahead of time. It also helped the owner asked for a medium meander that goes a bit faster than custom work. 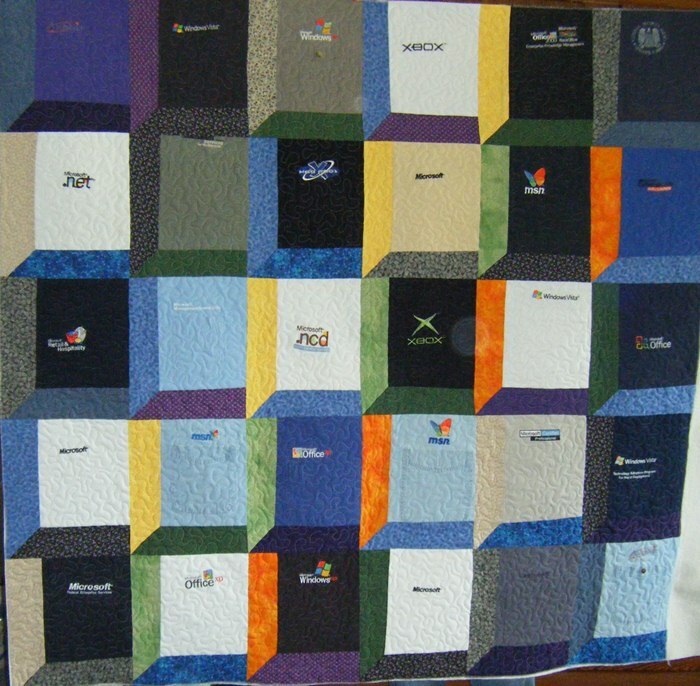 J said her son works for Microsoft and over time sent her shirts to make a quilt for him. AND… get this… I knew the attic windows setting and thought that was a clever way to use shirts in a quilt. But… windows… get it? For the Microsoft guy. 🙂 Quite clever!! I used a smaller than “medium” meander to keep the embroidery and shirts from puffing. Sometimes I quilted through a lot of layers and was thrilled the machine just worked like a knife to melted butter. 🙂 Think about it: pocket, seam allowance for pocket, shirt, interfacing behind shirt, batting, fusible for backing appliqué, backing appliqué, backing. Whew! Yes, there is an applique on the backing! The quilt is about 58″ x 58″ so this is a huge Windows emblem for the back! That’s neat. My friend Renea has made several Tshirt quilts, and used to use interfacing behind the blocks, but now, does not, and it quilts up nicely. 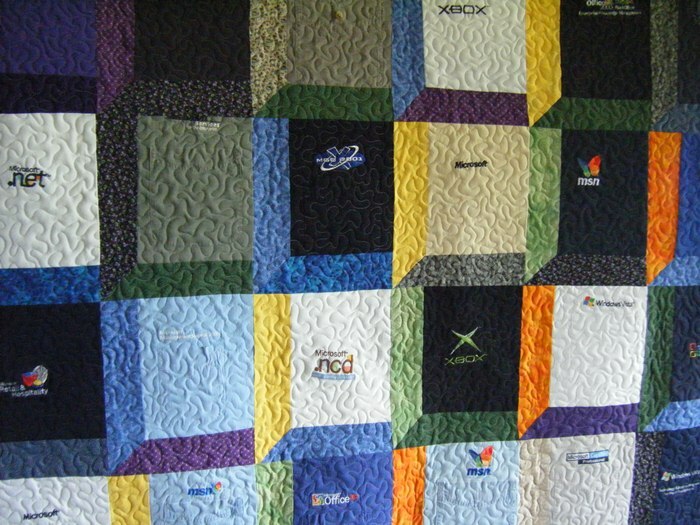 I have not made a Tshirt quilt yet, but thinking if I went through Louie’s closet, should come up with some for blocks. Maybe someday…..sigh…..
Another awesome creation, Joyce! It’s fun to see someone with job they love and such a passionf for it! Love this blog! Oh, that is so cool! 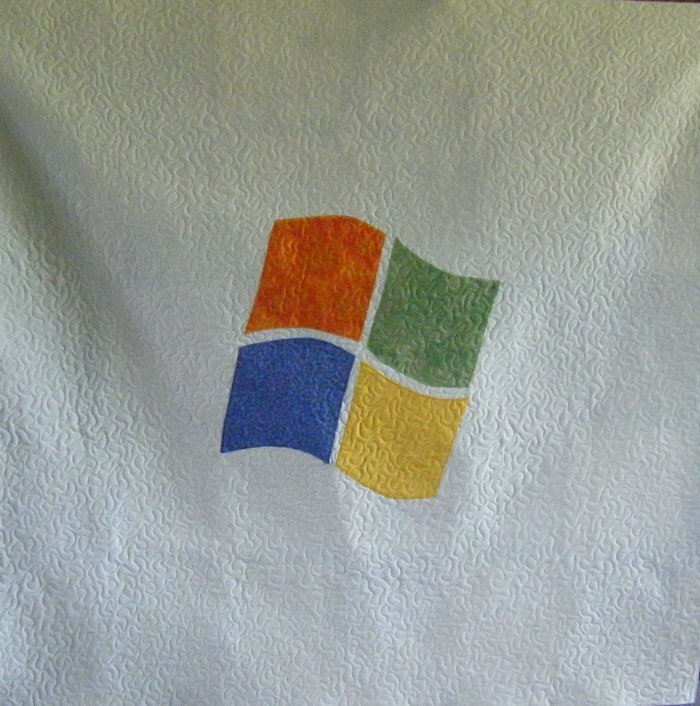 I love that setting for a t-shirt quilt, and love that she did the windows emblem on back! what a clever idea! windows for windows. 🙂 love the app on the back! Beautiful quilt, and job well done again!